Weekend Writing Warriors 8-2-15, a Fantasy Romance Prophecy, Chalvaren Rising, and New York City! Kort gently cradled her face between his hands. He stared at her, and a thousand words seemed to pass through his blue eyes. Flutters of trepidation strummed Mia’s belly. The sudden connection she felt to Kort was too intense. Especially since her father had not been the only one to predict the future. Before she died, her mother Melia had told her things, too. Mia pulled away from Kort and turned to stomp off into her cottage. Join me and tons of other amazing writers over at the WeWriWa website. You just might find your perfect story among the crowd. Mia wants a family of her own more than she wants sunlight on her skin, or air to breathe. In Chavaren Rising she’ll have to make a choice. Follow Kort Elias and his dragonlet back to the Kingdom of Chalvaren in order to help him in his quest, or end forever alone. Chalvaren Rising is due out any day. An editorial snag postponed the release in July, but, alas, these things happen. I’m convinced the publishing gods are helping me learn real-life lessons centered around patience and character growth. One thing’s for sure, when the book is ready it will be pure magic. Here’s to being very Zen-like about the entire publishing process. The delay did have its own benefits – during that time I visited New York City for the first time as an #RWA15 First Timer. The conference was amazing. I met new writers. Did tons of research for my Romantic Suspense series. Met my editor, and an agent. 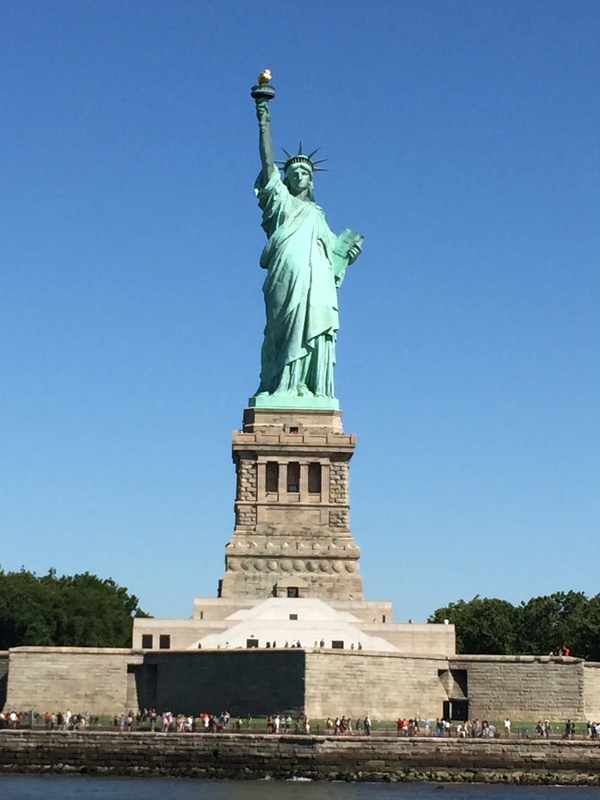 And, I got to see the Statue of Liberty up close and personal. All-in-all, a great trip – Bucket List updated. ← Chalvaren Rising ~ Paula Millhouse ~ Character Interview with Magnus the Dragon. Ahh! No! You aren’t supposed to stomp away on a prophecy like that! Though I can see how something like that would be overwhelming and unsettling and make you want to run. Love the line; “…a thousand words seemed to pass through his blue eyes. Flutters of trepidation strummed Mia’s belly.” Very nicely done. Nice work. Your scene has the feel of a classic tale to it. Looking forward to more. Thanks, JT. Mia’s got her work assignment cut out for her. That’s an interesting prophecy. It’s like if she doesn’t try she’l fail anyway so there is no way out really. Nice observation, Linda. Nothing like getting ushered through that first door of no return, huh? Thanks for stopping by! I love the line “a thousand words seemed to pass through his blue eyes” — to me that was the most intense line in the snippet. Kort’s got so much to tell her along the way. That’s one of my favorite lines in the story. Intimate and shocking. Poor Mia. Prophecies are tough to deal with. Are they fortune, or curse? Thanks for stopping by today, Jennifer. Wonderful tender moment turned tense. Love the strumming flutters of trepidation. Thanks for stopping by today, Christina. Safe travels. Good instincts, Ed. I love that book. Helping Magnus avoid those villagers with pitchforks was definitely Mia’s Save the Cat moment. Isn’t it amazing where you see those little things now? Ah, I recognize this as the moment Mia refuses her call to action in Act I. Can you tell I just reread “Save the Cat” by Blake Snyder, about story structure?